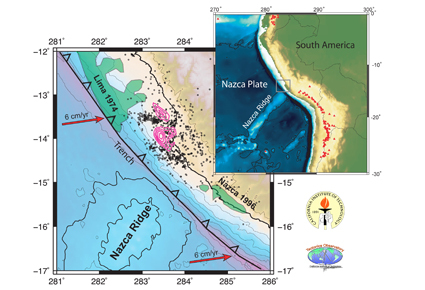 CALTECH (US)—Using data from GPS stations, researchers analyzed plate slippage following the magnitude 8.0 earthquake that struck in Central Peru in August 2007, killing more than 500 people. What the team discovered ran contrary to long-held assumptions about plate movement in the area—and suggests a model for predicting earthquake patterns. The team’s analysis of the GPS data—and the conclusions they were able to draw as a result—are described in a paper in the journal Nature. When the team mapped this aseismicity, they found that it occurred in a sort of “patchwork” pattern, says Avouac, with areas that “mostly slip aseismically and areas that mostly slip during earthquakes.” As it turns out, some of these areas are always aseismic, “creeping continuously,” he notes—and therefore act as a sort of permanent barrier to the propagation of an earthquake. Since seismic stress cannot build up in these particular aseismic areas, there is no stress to be released in an earthquake; any seismic rupture traveling through such an area would stop dead in its tracks. The lessons learned in Peru, Avouac says, should be generalizable to just about any subduction zone—Sumatra, for instance, or Chile—and probably to any other kind of fault as well. And so Avouac—along with Nadia Lapusta, associate professor of mechanical engineering and geophysics at Caltech, and postdoctoral scholar Yoshihiro Kaneko from the Scripps Institution of Oceanography, who worked on this project while doing his PhD at Caltech—decided to look at “the long-term evolution of slip on a model fault where two seismogenic, locked segments are separated by an aseismically slipping patch where rupture is impeded,” they explain in a paper published in the journal Nature Geoscience. When the locked segments (i.e., the areas in which stress builds up, and which produce earthquakes when they rupture) are far apart—or if the intervening aseismic area has frictional characteristics that make aseismic slip easy—they “tend to rupture independently,” says Avouac. If they are very close together, they tend to interact and eventually break together. The interesting question, Avouac says, is what we can expect to happen when the two segments are close, but not too close—and are separated by an aseismic area, as was seen in the Peru patchwork. By looking at what geologists call interseismic coupling—”the fraction of sliding that is aseismic and occurs between earthquakes,” explains Avouac—and by factoring in distance, time, and the sliding speed, the team was able to determine whether an earthquake that begins in one locked area is likely to stop when it hits an aseismic barrier, or whether it will be able to cross that barrier and rupture the segment on the other side. “This model demonstrates that, based on geodetic monitoring of a subduction zone, we can not only locate the places that are accommodating plate motion through slow, aseismic slip, but also determine the probability that they will be able to arrest seismic ruptures,” says Lapusta. The hope, he adds, is that this sort of modeling can be applied to data derived from actual subduction zones. “We want to create models that will take into account the physical properties of a fault to produce a scenario of how the system might evolve,” he says, in much the same way that meteorologists forecast the weather. The team included researchers from the Institut de Recherche pour le Développement; Instituto Geofisico del Perú; Ashima Research in Pasadena; Géoazur in Valbonne, France; and University of California, Santa Cruz. The work was supported by grants from the Institut de Recherche pour le Développement, the Gordon and Betty Moore Foundation (through the Caltech Tectonics Observatory), and the National Science Foundation (NSF). The work detailed in the Nature Geoscience paper was funded by grants from the NSF and the Gordon and Betty Moore Foundation (through the Caltech Tectonics Observatory).